How Well Do We Supply? The most important concept is your strategic focus, which many quantify as critical success factors, then present to the key team members as strategic intent, priority issues or whatever phrase signals 'this we must do,' this is fundamental to our success. What must we do very well to achieve our vision? 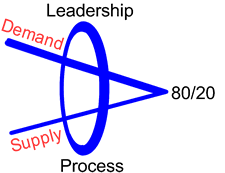 After you have studied the demand - supply problem, you make decisions as the leaders to prioritize work. How focused are you and your employees on your customers? Does our strategic focus empower our key players to act? Think as a boss: Will it benefit our customers? Is the timing right? Do I have the resources? Who can I trust to do it? What is it going to cost? What is the effect on the bottom line? How soon must you act? I use the 80/20 rule. Of the 100% of the important things you must do, about 20% are going to have the most impact on your success. Do you need to "refocus" your folks on that 20%? Are they accustomed to improving the 20%? From the mid-1990s on, many firm leaders have emphasized continous process improvement as a way to stay focused on the most important 20%. The manufacturing sectors methods and techniques to improve quality through continous improvement mirgrated to most business sectors. The "will you stay on the phone for a short survey" is an example. Does your firm have a continuous process improvement culture able to implement the strategic change needed matter of course or do you need to shock them to move? Sometime you need to fix the culture before you can attack a vision.